The original Tavanasa Bridge (pictured) was Swiss engineer Robert Maillart’s third three-hinge semi-hollow box arch structure in reinforced concrete. It was a more refined design than his earlier bridges. Unfortunately, it was was destroyed by a landslide in 1927. The present bridge is a 1928 replacement by Walter Versell — a deck-stiffened concrete arch in a similar vein to Maillart's work. Although Maillart (1872-1940) had been working on three-hinge arch developments, using early versions at Stauffacher in Zürich (1899) and at Zuoz (1901), the bridge at Tavanasa represented a big step forward. Nothing like it had been attempted before. He learned from his experience with the Zuoz Bridge, where the spandrel walls had cracked at their connections to the abutments. At Tavanasa, he avoided this issue by simply omitting most of the spandrel panels. The shallow single arch was only connected to the bridge deck past the quarter points of the span. The bridge was 61m long overall and had masonry abutments. The reinforced concrete arch over the Rhine spanned 51.25m, topped by a reinforced concrete deck 3.6m wide (roadway 3.2m). The central hinge was 5.7m above the abutment hinges. The bridge was completed in a little less than a year and cost 28,000 Swiss Francs. As was common in Switzerland at the time, and especially applicable to unique designs such as this, full-scale load testing was carried out to verify the bridge's robustness. On 28th September 1905, the bridge passed the tests — with excess loading — and was opened to traffic. All was well for almost 22 years. Then, around midday on 25th September 1927, after a night of heavy rain, a landslip above the town caused a landslide to pour down the hillside, taking houses and Maillart’s bridge with it. Seven people died and the bridge was destroyed completely. Professor Mirko Ros (1879-1962) analysed some of the concrete debris shortly afterwards and found that the material’s strength had not deteriorated. The bridge’s destruction was simply a misfortune of nature. He reported that the Tavanasa Bridge was "a small but exemplary masterpiece of Swiss bridge building. Its remains are now silent witnesses to the ability and the love of the designer for his work". Maillart wasted no time in designing two alternatives for the bridge’s replacement. First, he prepared plans for a tall deck-stiffened arch with four transverse walls each side, between the arch crown and the stone piers at the ends of the approach structures, the south one of which overflies a railway. 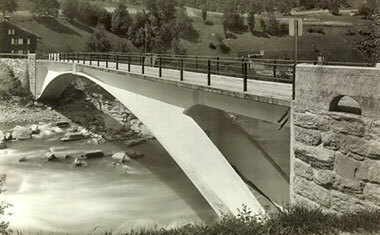 It was a design similar to his 1925 Valtschielbach Bridge in Donath. Second, he drew up an enhanced version of the original bridge. Maillart and contractor Florian Prader (d.1946) entered the first redesign into a design and build tender for the new bridge but lost the bid. However, Maillart’s involvement with the Tavanasa Bridge didn't end there. He was commissioned by the cantonal authorities to evaluate the proposed foundations of Walter Versell's (1891-1989) winning design, and to work with Ros on load testing the finished structure. The present Tavanasa Bridge, located on the same site, is also a reinforced concrete deck-stiffened arch, but with two intermediate transverse walls each side of the crown. It was completed in 1928 at a cost of 125,000 Swiss Francs.